Make the honeymoon an adventure. Escape to the Cascade Mountains for a thrilling paddle on the McKenzie or Willamette Rivers or a daring ride on some of the nation&apos;s best mountain biking trails. Retire to a cozy fishing cabin or riverside lodge to sit by a roaring fire or immerse yourself in the rejuvenating hot springs. 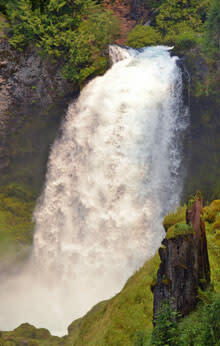 The Cascades are a hiking paradise with lush forests, waterfalls and scenic vistas. A network of paths include easy to challenging. During the summer hike along the verdant McKenzie River Trail to Blue Pool and admire the startling vibrancy of colors shimmering in this mountain wonder. Dip your toe in the cool, restless river and kiss beside a roaring waterfall. Winter warming huts cater to snow shoeing in the winter and snow parks offer slopes for sledding. Ski or snowboard at one of several ski resorts and toast a day on the slopes in the warmth of the ski lodge lounge. During the summer, travel the scenic Highway 242 up to the Dee Wright Observatory overlooking a dramatic lava landscape. Reminiscent of a medieval fortress, this unique structure made from the lava rock itself, offers clear sight lines to the surrounding mountain peaks. Drive or cycle the Aufterheide to Oakridge and picnic at Greenwaters Park. A sprawling natural venue hosts outdoor concerts and easy hiking and cycling trails. Fish along the river and share your fish tales later that day at the local brew pub. And of course, relax in your honeymoon hideaway whether it is a luxury tipi or a lake-view B&B. Kiss your love at the top of a castle-like tower in the middle of vast lava fields. Hold hands beside Oregon's second highest waterfall. Luxuriate in the hot spring-fed swimming pools at a riverfront lodge. Wade into the steaming pools at McCredie Hot Springs. Climb to the tops of these beauties with professional tree climbing guides.